The bottom end of the motor is going together. The degree wheel for timing the cam is on the right and the clean block (with its nice red insides) is evident. Its fun to see the block and all the casting shapes. Work is being done by Walt Spak in Pittsburgh, long time owner of the s. 2 (from about 1975 to 2005), so he’s happy to fiddle with the engine. 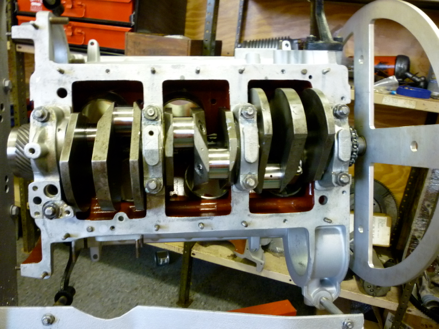 Walt has built many Aurelia engines over the years, and has an Aurelia and Fulvia himself. Note the casting date for the block as Feb of 1952, and above, the clean crank, now balanced for the new rods.